NEVER BUY THE SUN released as free download. Billy Bragg’s brand new song ‘Never Buy The Sun’ takes aim at the whole sorry story of News International’s systemic failure to understand that there are limits to legitimate news gathering. Billy concludes that neither press, police nor politicians come out of this scandal looking good. Only the people of Liverpool can hold their heads high. Their refusal to buy The Sun in the wake of that paper’s unfounded accusation that Liverpool FC supporters robbed the dead victims of the Hillsborough Disaster in 1989 shows that not only do the scousers have principles, but they are also determined to hold onto them in an often cynical world. 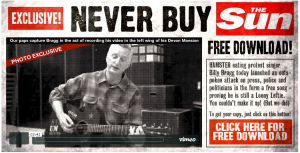 Written last Friday, first performed on Saturday, a video clip posted on Sunday, recorded on Monday, mixed on Tuesday and made available as a free download today, Wednesday, Billy Bragg’s new song ‘Never Buy The Sun’ could hardly be more urgent. In the wake of the announcement that Rupert Murdoch had decided to close the News of the World, Bragg put pen to paper after spending the day driving north listening all the way to discussions about the ramifications of the phone hacking revelations. After writing the song in his hotel room, Bragg polished the song enough to debut it during his set at Garforth Festival. The rapturous response that he got convinced him to post a video of himself performing the song in the dressing room of the festival, which, after 48 hours, had notched up over 20,000 views. Back home in Dorset on Monday, as the allegations against News International spread to include The Sun and The Sunday Times, Bragg gathered some musician friends together in a Weymouth studio to record the song for immediate download from his site. Mixed on Tuesday afternoon, the track is available now as a free download from billybragg.co.uk. Although the digitisation of music has had negative effects on the music industry, it has made the process of recording and distributing material much simpler and faster. If like Billy, you’re the writer of songs that try to offer a different perspective on the big issues of the day, the turnaround time helps add to the topicality. Thanks Billy. As a Souser I’m proud of the stnce we have taken. I wouldn’t wipe my ar*e with ant Murdoch paper. I implore all football supporters to boycott the S*n. It’s poison. You would have to be rubbing your hands with this “end of days” for the dirty Digger. Best time to happen and he is too old to recover so what a lovely thought as he nears his end, in both respects. He will never, ever be forgiven for what was done under his banner. Anyone watch the dispatches programme on Monday night??. Those who were advocating a sale to Mr Linn last summer need to count their blessings that it didn’t happen. It’s a stunning indictment of all our media but especially the sporting ones that this story has been buried. Man utd, Bryan Robson & Ferguson were clearly shown up for their “dodgy dealings” in this documentary, enough so, that other questions need to be asked about other issues of concern such as refereeing decisions which seem to clearly favour that club. If rules can be flouted as easily as this documentary suggests and it’s no longer a sport but just a business as captain fantastic has been caught spouting then surely refereeing decisions are at the heart of what 1. gives a team most influence 2. is the easiest & most cost efficient may for any potential tampering to take place. This needs to be highlighted & scrutinised. My question is where are all the real journalists gone????? Previous Previous post: 22 years later The Sun boycott continues. Every day of the week.